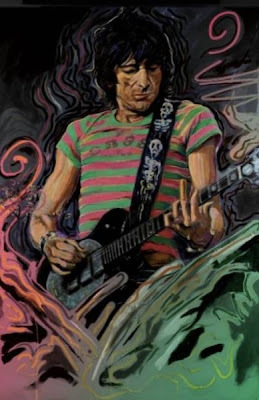 Rolling Stones guitarist Ron Wood’s newest collection of fine art, “Ronnie Wood: Raw Instinct,” has opened at London’s Castle Fine Art Gallery. The exhibition consists of 100 pieces of original art, including portraits of bandmates Mick Jagger, Charlie Watts and Keith Richards, alongside a striking self-portrait. Wood received formal art training at Ealing College of Art and has continued to paint and draw for over 35 years, ranging from self-portraits, other musicians and family and close friends, together with landscapes and animal studies. Original paintings from the collection will be available for purchase through high street art gallery chain, Castle Galleries, as well as a small number of independent galleries. Each piece in Wood’s new collection will be available from £3,000 to £150,000. Learn more about the collection at the Castle Fine Art Gallery here. Wood and the Stones are currently playing shows across North America on their “50 & Counting” tour; the band’s next show is Saturday in Toronto.